The Kid explores the outer reaches of the iPad. Supergiant Games' Xbox Live Arcade and PC adventure, Bastion, quickly earned numerous awards and became a favorite among players when it debuted in July 2011. That's why the game's release on iPad is such a big deal. Not only does it give a new and hungry user base a triple A experience to enjoy on the go, but it also represents what is possible on Apple's tablet in the hands of a skilled developer. That said, the game retains just about everything that made it a worldwide hit. Players control a young boy known only as The Kid through a beautifully hand-painted world, with the primary goal to rebuild this fictitious place while also bringing a safe zone called the Bastion to life using magical cores, whereupon which the player has the option of accessing six structures that serve important roles in the hero's development. The Distillery, for example, imbues The Kid with personal boosts, while the Forge contains weapon upgrades. Players can also interact with different characters, unravel the plot's intricacies and take in the sights. The bulk of Bastion, though, involves visiting corrupt areas in search of cores, assorted loot and fragments which function as the game's currency. 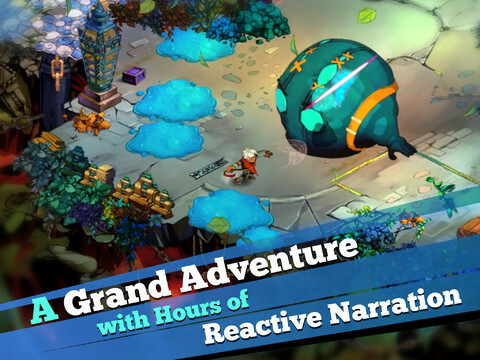 Through it all, a gravelly-voiced narrator, Rucks, provides commentary throughout the entire experience, adding a satisfying layer of personality that makes Bastion feel more like an interactive storybook. The graphics, however, easily steal the show. This is definitely one of the best-looking titles on the iPad, with gorgeously detailed 2D visuals comprised of various enemies, floating platforms that give way/magically appear and colorful plants, some of which fight back. The fact that Supergiant Games was able to translate all of this to Apple's device without a drop in performance is quite an achievement. As for the controls, you guide The Kid throughout each stage by tapping the screen, similar to Chillingo's ORC: Vengeance; you can switch to a virtual analog stick, but we don't recommend it. Meanwhile, The Kid auto attacks enemies directly in front of him, which is both a salty and sweet set-up. Since creatures attack from all sides, preventing him from taking damage will be tricky. So will preventing the little guy from accidentally falling off the side of a platform, since he tends to walk a little too close to the edge; thankfully, he teleports right back. Ultimately, you'll quickly learn how to navigate him around the tricky parts, and double tap like mad to roll away from baddies. Either that, or master the block button to unleash powerful counter attacks. 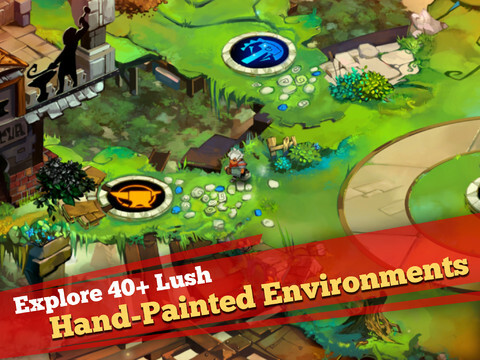 In our opinion, the decision to download Bastion will be evident the moment you lay your eyes on it. This is without question one of the most entertaining and smartly designed adventures we've seen for the iPad, a game brimming with visual splendor and old school dungeon crawling. For $4.99, we'd have trouble suggesting a superior alternative. 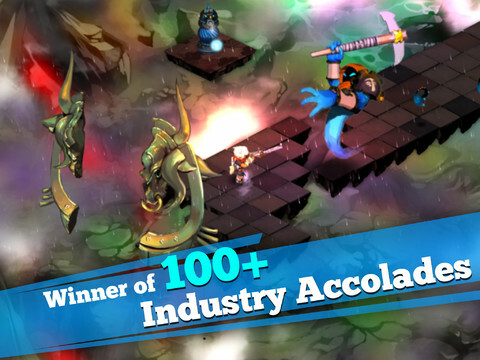 Review code provided by Supergiant Games. What's Hot: Outstanding port of the XBLA smash hit, memorable soundtrack and well-written narration, a wealth of items and weapons to find, stunning hand-painted graphics. What's Not: Auto attack diminishes the player's sense of possessing full control over The Kid.